The following day after stumbling upon Jolly Brewery we planned the evening as a self-guided brewery tour; starting with Zhang Men Brewing. 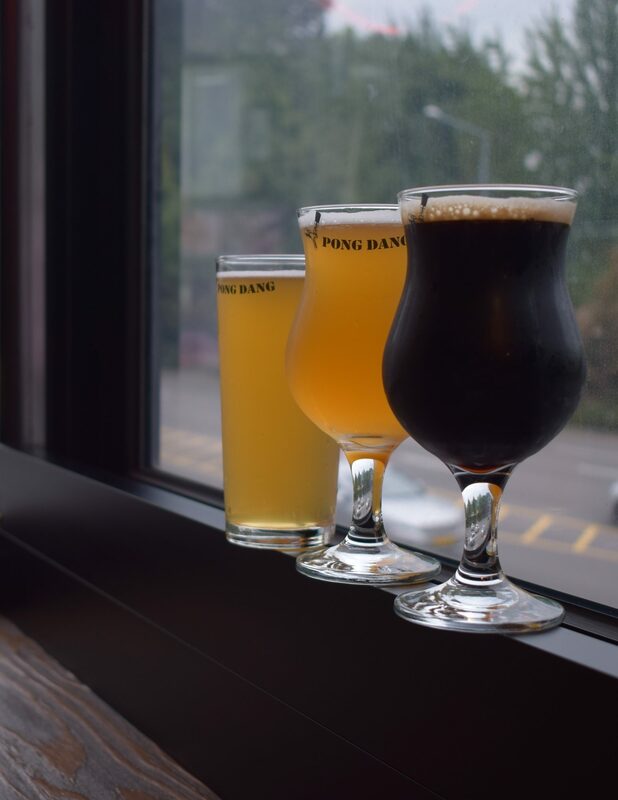 Zhang Men has a few locations now as they were the first craft brewery opened in Taipei. Their Da’an location, in particular, has a tiny, yet very inviting taproom. There “tap water” also has a great allure. Shortly after our arrival, they were packed to the gills. The Editor and I had some killer garlic fries, a flight, and a pint before heading out. The first sip on the flight was their Fruit Sour. It was definitely in the sour category and tasted like a berry blend, but I couldn’t get past the copper/tin, vomit finish. Not a great start. The second brew was an immediate turnaround. Mulberry Ale was a bit more like a sour than a fruity ale. I love mulberries and this one really captured the essence with its tartness balanced by a delicate sweetness. This was a nice way to forget about what I just had. Third up was Honey Ale. I will say this went down more like a mead than an ale, which was a nice surprise. Many times, to me, honey ales have a bit of a burnt honey flavor and not enough of a sweet, candied honey quality. Next up was Passion Fruit Ale. Based on experience drinking as many as I can- it must be very difficult to get passion fruit to come forward in a beer. Not everyone does, but I love the tartness of passion fruit. It’s very aromatic and in beer form I imagine it to come out almost like another sour. This one, like many others, was just a ‘meh’ wheat beer that smelled good. Osmanthus Ale is an ale brewed with osmanthus flowers that grow mainly in Taiwan, but can be found in a few other spots in southeast Asia. This brew smelled earthy like fresh cut grass and finished on my tongue with peaches and apricots. I always do my best to drink something completely unique like this or a mainstay that I’m really hoping I’ll enjoy like a BBA stout. This brew was definitely the former and, though it wasn’t my favorite, it was a nice change of pace. If you’re getting bored of the ole standard this one’s worth a look. The last brew on the flight was a Cream Ale. This cream ale was smooth, creamy, and slightly sweet and was the perfect way to end our beer-sploration for the day. Overall, we had a great experience at Zhang Men and I am going to block the last beer out of my mind to not sully the flight. All in all, I give them an 8.8 out of 10.